This is a personal website of Dr. William Romanishin, emeritus professor of astronomy at the U. of Oklahoma, and Visiting Scholar at Northern Arizona University. If you have comments or questions, you can contact me by email: wromanishin(insert usual symbol) ou.edu. Here I am in front of the Lowell/Discovery Channel Telescope. 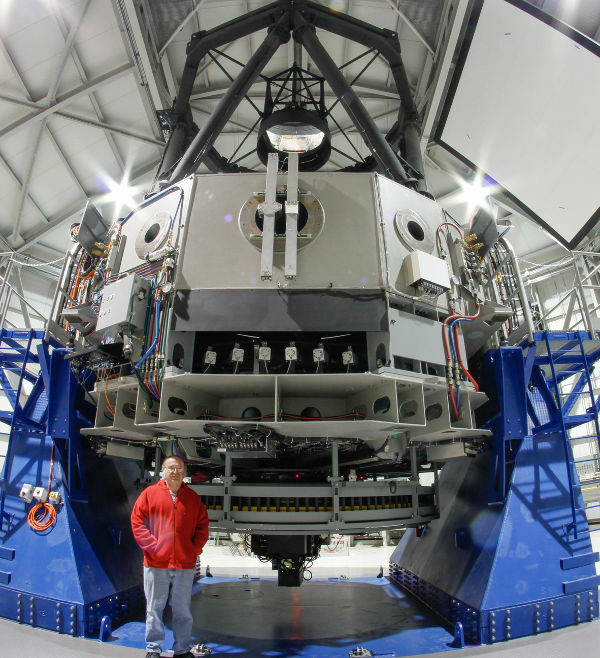 This is a 4.3meter telescope near Happy Jack, AZ. Photo by Steve Tegler. ORBITAL TILTS AND HIGH-FLYING MOONS published in December 2018 REFLECTOR magazine. A FORTUITOUS SIGHTING OF AN EARTHLIT MOONRISE published in Winter 2019 MERCURY magazine (Astronomical Society of the Pacific). An Introduction to Astronomical Photometry Using CCDs A freely available "textbook" on using CCDs. Does anybody really know what time it is? Link to external site with current UTC date and time, as well as discussion of time zones, etc. Jupiter, most massive of the planets, greatly affects the motions of minor solar system bodies in the inner and middle reaches of the solar system. Key to understanding the role of Jupiter is the idea of an orbital resonance. An orbital resonance occurs when two bodies orbit the Sun with orbital periods that have a ratio equal to that of two small integers. For example, the Jovian Trojans orbit the Sun with the same period as Jupiter, so they are in a 1:1 resonance with Jupiter. These objects orbit in two "clouds" on either side of Jupiter. The Trojan orbits are stable, due to an effect first explained by Lagrange. In contrast to the 1:1 resonance, at some resonances with Jupiter we see a *deficit* of small bodies. For example, at an orbital period of exactly 1/3 that of Jupiter, there is a definite lack of minor bodies. This is called the 3:1 resonance, as the small body would orbit the Sun 3 times for every 1 orbit of Jupiter. This deficit of objects is one of the well known Kirkwood gaps in the distribution of the semimajor axes of asteroids. There are also Kirkwood gaps at 3/7, 2/5 and 1/2 of the orbital period of Jupiter. The Hildas (named after the object (153) Hilda) are a group of objects that are found at an orbital period 2/3 that of Jupiter (3:2 resonance). As at the 1:1 resonance, there is a definite *enhancement* of objects at the semimajor axis corresponding to this period. These objects are distributed in their orbits so that they do not come close to Jupiter. The objects are found in an approximately triangular shaped pattern. The *pattern* revolves around the Sun with the same period as Jupiter (11.86 year), but each object revolves around the Sun with 2/3 that period (or about 7.91 year). Jupiter always lies along one of the "sides" of the triangle, so that each Hilda passes the line between Sun and Jupiter when the object is near perihelion. This means that each Hilda remains more than 1.5 to 2 AU from Jupiter, even though the aphelion of the Hilda orbits can be 4.8 to 5 AU. This "Jupiter avoidance" allows the Hilda orbits to be stable. To understand what is going on here, an animation is worth 10,000 words! See the plot and the animation below. 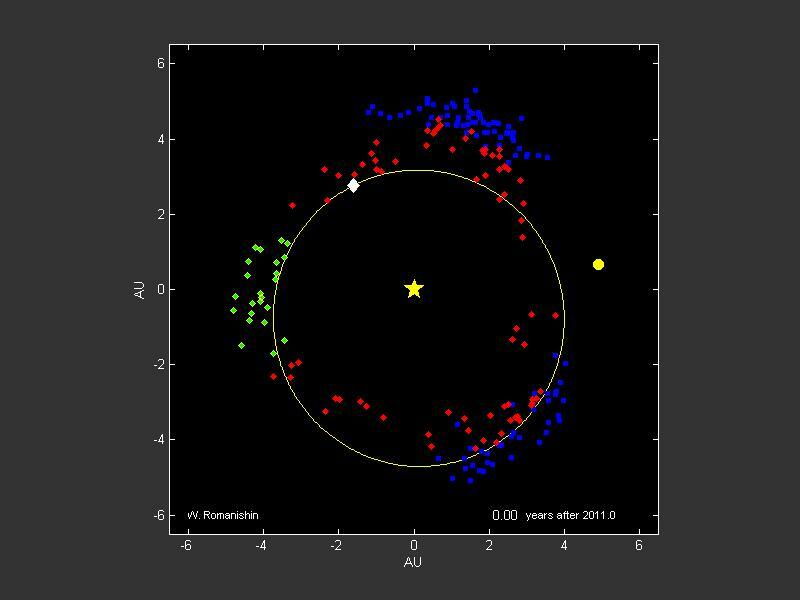 That the Hildas and Trojans form two very distinct and well-defined groups of asteroids can be best seen in a plot of semimajor axis (a) vs. eccentricity (e) of asteroid orbits. A good plot can be found here. The Hildas are found near a= 3.95 AU and the Trojans near a=5.2 AU. Where do the Trojans and Hildas come from? Are they more akin to the mostly rocky main belt asteroids that orbit closer to the Sun or to the comet-like minor objects (Kuiper Belt Objects) in the outer solar system? New ideas on the history of the solar system suggest that the Jovian Trojans, and perhaps the Hildas, are some of the objects that were scattered from the outer solar system into the inner solar system about 4 billion years ago. This scattering event might also account for the Late Heavy Bombardment of the Moon and Earth. If the Trojans and Hildas did originate in the outer solar system, study of their physical properties will help elucidate the effects of solar heating on comet-like bodies, as these objects have been much closer to the Sun than the outer solar system obejcts such as Kuiper Belt Objects and Centaurs. To see a "movie" (animated gif) of how these objects move over a 12 year period (approximate orbital period of Jupiter), click on the the "Dances with Jupiter" link below the plot. Careful viewing of the animation shows that the triangular pattern rotates at the same rate as Jupiter, but that the individual objects orbit the Sun with about a 7.9 year period. Thus the individual objects appear to move through the pattern. For example, the green coded objects, which start out in an apex of the triangle at the beginning of the animation, are found along one of the sides of the triangle a few years after the start of the animation. As the green objects come closer to the Sun, they also appear to string out along the triangle, as each object moves faster as it comes closer to the Sun in its orbit. Although the plot shows 100 Trojans and 100 Hildas, there are many more known. As of July 2011, there are almost 5000 Jovian Trojans known and almost 4000 Hildas. These numbers will undoubtedly increase enormously when new deep surveys such as LSST and Pan-STARRS are in full operation. Dances with Jupiter -Hildas and Trojans- The Movie! The JPL HORIZONS system was used to generate lists of the positions of each object every 10 days from the start of 2011 to the end of 2022. At each time step, MATLAB was used to generate a frame showing the positions of the objects. The individual frames were converted to .gif images and then combined into the animation using gifsicle. This plot shows the tracks of 3 Trojans and Jupiter in the regular Sun-centered coordinate system over a period of 25 years- a little over 2 "years" of Jupiter. To see an animation of the paths being traced out, click on the link under the plot. The green dot is the Trojan (1143) Odysseus, the red dot is (11395) 1998 XN77 and the white dot is (1404) Ajax. The tracks repeat from one orbit to the next, at least to the resolution provided by the plot. In reality, the orbits of the Trojans are perturbed by Jupiter (and to a lesser degree by the other planets) so that the orbits do not precisely repeat. Again, these plots were produced from x,y positions calculated by the JPL HORIZONS system, which includes the gravitational effects of all the planets and even some of the larger asteroids. Another way to look at the motions of these same orbits is to go into a frame of reference that rotates with Jupiter. This frame has its origin at Jupiter, but rotates so that the Sun-Jupiter line is always along the x axis. Thus the Sun is almost fixed in this coordinate system, but is not completely fixed because of the eccentricity of Jupiters orbit. Again, click on the link below the plot to see the motions of the three Trojans in this frame. Unlike the results of simple 3 body gravitational simulations (Sun + Jupiter + massless Trojan), in which the orbits in this frame are periodic and "pretty", in this more realistic plot the obits are more irregular.